Our Go-Go (Groenendael) was bred by Toby Comme un Reve Noir in August of this year and so she is expecting her second litter around the 23th of October:-). 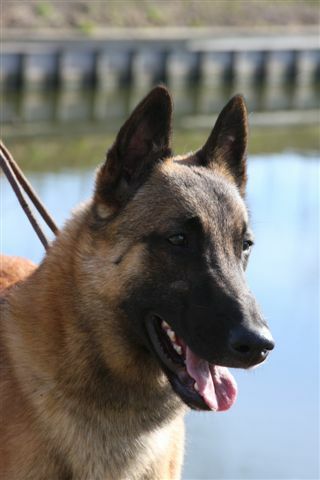 Our Prozac (Malinois) was bred by Intox du Hameau St Blaise a fw weeks ago. Fingers crossed she apears to be pregnant of her first litter! All puppies Quilty (Quality Girl) gave birth to found new homes. We kept Chanel ourselves. On the 25th of July our lovely Casyka’s Quality Girl gave birth to 5 females and 1 male. Red and grey coloured. Both mom and puppies are doing fine. Dad is High Clearings Maestro. There are some puppies available so if you are interested please contact us. All puppies of Casyka’s Gypsy-Ho who was mated by Rodin van Moned found new homes. They will leave us at the beginning of August. All Puppies of Go-Go X Vahur found a new home and are doing very well! We are happy with the new homes! 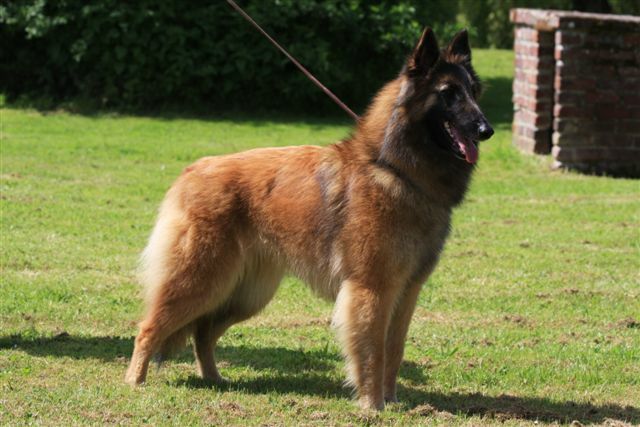 A new litter is on it’s way; tervueren this time: Casyka’s Oh my God (OhOh), daughter of Droef du Bois du Tot, was mated by Rodin van Moned (Arkan), a very nice grey male. So we expect red and grey puppies. Around the 3rd week of August we expect them to be born. Go-Go gave birth to 2 females and 7 males last night! Mom and puppies are doing fine :-). Just got back from the vet. Go-Go got her second ultrasound and we saw lots of puppies!!!! How many….? We don’t know excactely because they were all over the place and therefor difficult to count 🙂 Happy with this news!!!! Go-Go is doing great being pregant. She eats a lot :-). When she is together with he malinois puppies which are 8 weeks old now she is really really happy and enthousiastic. She approaches them very kind and tender.Very lovely to watch. I think she is looking forward having her own puppies :-). After having some trouble with our provider and therefore lost our site……………… we’re back!!!!! With a brand new website which is still under construction. So if you cannot find what you are looking for, please contact us! – and the title Winner 2010! Today Ivan won the title Winner 2010 congratulations Yuri and Sindy!!! We are very proud! Yesterday Ivan won the agility club championship their were 17 dogs registered what a weekend for Ivan! Again congratulations Yuri and Sindy. In the night of 23 november Fickle’s temperature dropped! So it will be a long night! We expect the puppies very soon! We expect the “puppies from Fickle” in 1 week! Added new pictures of the M-litter at “Week 3” they are 17 days old now they grow very fast! Finally new updates about the puppies!!! Added new pictures at “week 2” from the M-litter, al the puppies have their eyes open! “Remie (Smika van Sprangerhof)“ had a check up at 12,5 years old, we wanted to know if he is still useable for breeding, the vet said everything was alive and kicking, we are very happy with this result and we will use him very soon!!! At the 14th of November we had the litterreunion from the K-litter, soon I will update the photo’s!!! Only “2 female puppies” available from the M-litter! “Fickle” is due in 3 weeks!!! The puppies are born on the 1st of November! 4 Males and 4 Females a few puppies available! Dizzy starts with giving birth!!! Today we received the X-ray result of “Droef” she has HD-A!!! At the show in Utrecht Casyka’s Genderow “Jovi” won the last CAC CACIB he needed to become Dutch Champion!!! Puppies expected in 2 weeks!!! Updated the page of Ituha “Luta” at the end of October he will be for the first time father! Good Luck with the puppies Marianne Brett! Keep us updated! Updated the page “Showresults 2010”, “Smika van Sprangerhof” became Reserve Best in Show Veteran we are very proud of our old boy! I wanna thank everyone for the emails, text messages, and messages on Facebook for my birthday yesterday! I have a great day with lots of visitors! Fickle is in season! She will be bred with Cash du Bois du Tot soon!!! My computer crasht! Watch contact for the email adress! Casyka’s Fickle is selected SR (Sujet Recommandé) She is the first Casyka who got this title! A nice new start with my new webpage. Still lots of work to do, but there is a start! Special thanks to Sophie Jouannet who made my new logo! Copyright © 2019 Casyka.nl. Met trots ondersteund door WordPress en Stargazer.